This May 29, 2018, file photo shows George Soros, founder and chairman of the Open Society Foundations, listen to the conference after his speech on saving the European Union at the European Council on Foreign Relations' annual council meeting in Paris. 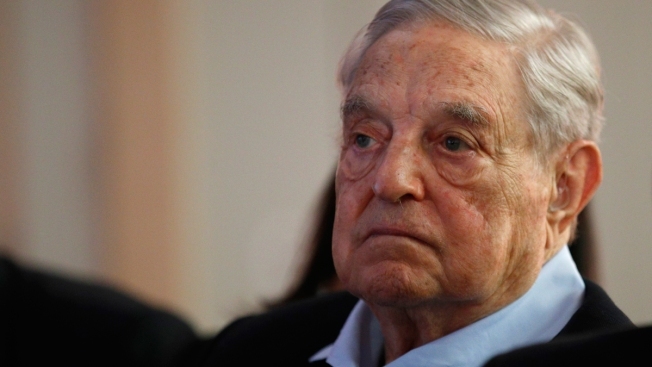 The president of George Soros' foundation blasted Facebook executives over allegations that the company had funded a Republican-opposition research firm to discredit Soros in part by leveraging anti-Semitic sentiment toward the billionaire liberal donor. The New York Times initially reported the allegations Wednesday evening as part of an investigation into Facebook's handling of data exposure through the Cambridge Analytica scandal and the spread of false information linked to Russia. According to the Times investigation, Facebook engaged Washington-based consultant Definers Public Affairs to help maintain its image as it trudged through a wave of negative coverage. The Times said reporters received a research document from Definers after the House hearing this summer that suggested Soros was behind a movement against Facebook. An official from Soros' foundation reportedly told the Times it had not supported the "Freedom from Facebook" group targeted by the company and had not made grants in support of campaigns against Facebook. Soros has long been a target by the political right and was one of the recipients of a pipe bomb last month that were also sent to many liberal politicians. Following the Times investigation, Facebook ended its relationship with Definers, Facebook said in a blog post Thursday. Analysts missing mark on shares of Apple and FANG: Cramer from CNBC. In a letter addressed to Facebook COO Sheryl Sandberg and copying CEO Mark Zuckerberg along with several Facebook investors and Washington politicians, Open Society Foundations President Patrick Gaspard denounced Facebook's alleged efforts to disparage Soros. "As you know, there is a concerted right-wing effort the world over to demonize Mr. Soros and his foundations, which I lead—an effort which has contributed to death threats and the delivery of a pipe bomb to Mr. Soros' home," Gaspard wrote in the letter, which was also posted on his Twitter account. "You are no doubt also aware that much of this hateful and blatantly false and Anti-Semitic information is spread via Facebook." Gaspard said that beyond Soros, "Your methods threaten the very values underpinning our democracy," and asked to speak with Sandberg in person about how Facebook plans to move forward. In the blog post Thursday, Facebook said there were "a number of inaccuracies" in the article and said that while it did hire Definers to look into who funded an anti-Facebook group, "To suggest that this was an anti-Semitic attack is reprehensible and untrue." Facebook did not immediately respond to a request for comment for this story. I was shocked to learn from the New York Times that you and your colleagues at Facebook hired a Republican opposition research firm to stir up animus toward George Soros. As you know, there is a concerted right-wing effort the world over to demonize Mr. Soros and his foundations, which I lead—an effort which has contributed to death threats and the delivery of a pipe bomb to Mr. Soros' home. You are no doubt also aware that much of this hateful and blatantly false and Anti-Semitic information is spread via Facebook. The notion that your company, at your direction, actively engaged in the same behavior to try to discredit people exercising their First Amendment rights to protest Facebook's role in disseminating vile propaganda is frankly astonishing to me. It's been disappointing to see how you have failed to monitor hate and misinformation on Facebook's platform. To now learn that you are active in promoting these distortions is beyond the pale. I would appreciate the opportunity to discuss this matter with you in person, and to hear what steps you might take to help remediate the damage done by this deeply misguided--and dangerous--effort carried out at Facebook's behest.